After seeing petroglyphs, public lands chief gets taste of bitter monument split. Scott Sommerdorf | The Salt Lake Tribune U.S. Interior Secretary Sally Jewell talks with Vaughn Hadenfeldt about ancient petroglyphs - some of which have been vandalized - near Comb Ridge, Saturday, July 15, 2016. 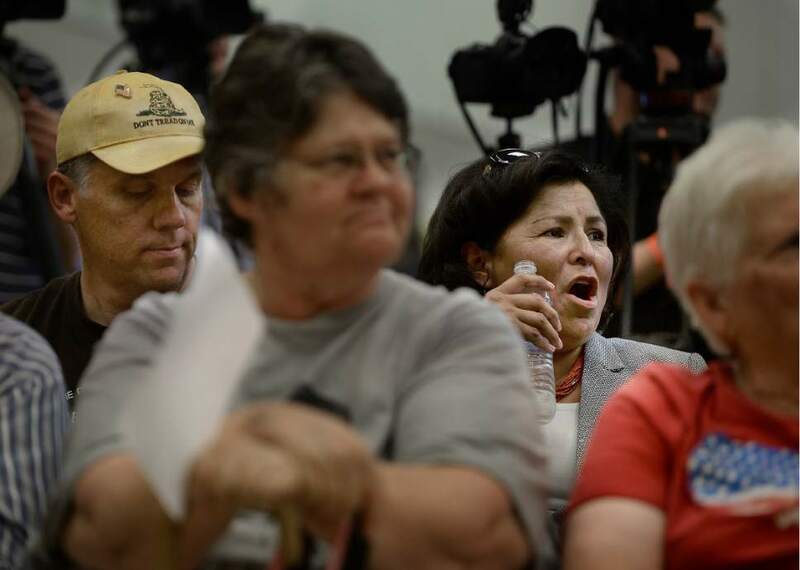 Scott Sommerdorf | The Salt Lake Tribune San Juan County Council member Rebecca Benally yells "boo" as a supporter of the Bears Ears National Monument finished speaking during the public meeting at the Bluff Community Center, Saturday, July 16, 2016. San Juan County Councilman Phil Lyman is at left. 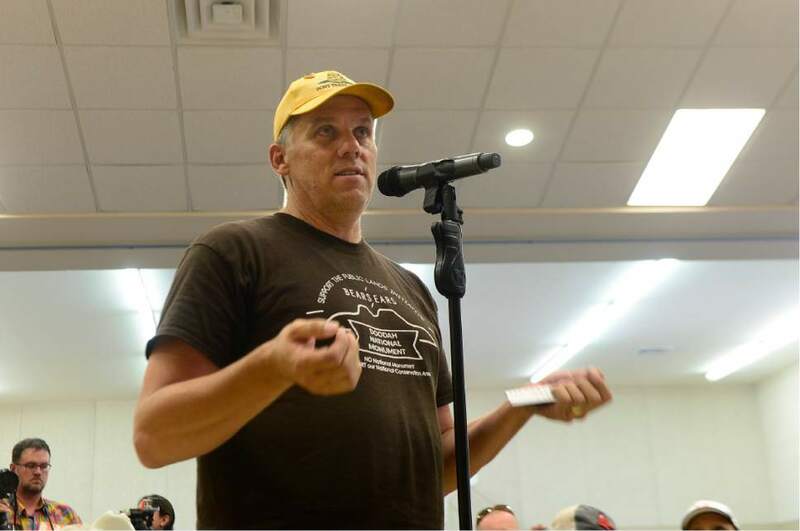 Scott Sommerdorf | The Salt Lake Tribune San Juan County Councilman Bruce Adams got jeers from the native people after he announced that "my ancestors first settled this place" as he spoke during the public meeting at the Bluff Community Center, Saturday, July 16, 2016. 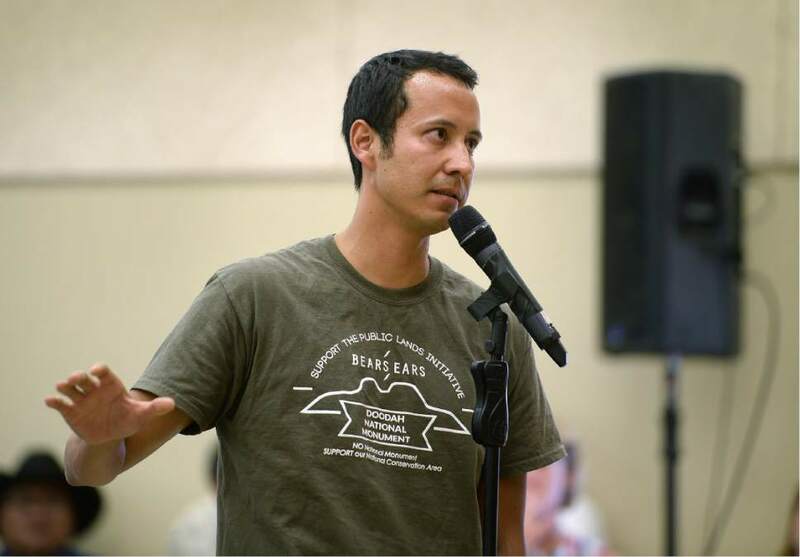 Scott Sommerdorf | The Salt Lake Tribune Native man Byron Clarke speaks during the public meeting in opposition to the Bears Ears National Monument at the Bluff Community Center, Saturday, July 16, 2016. 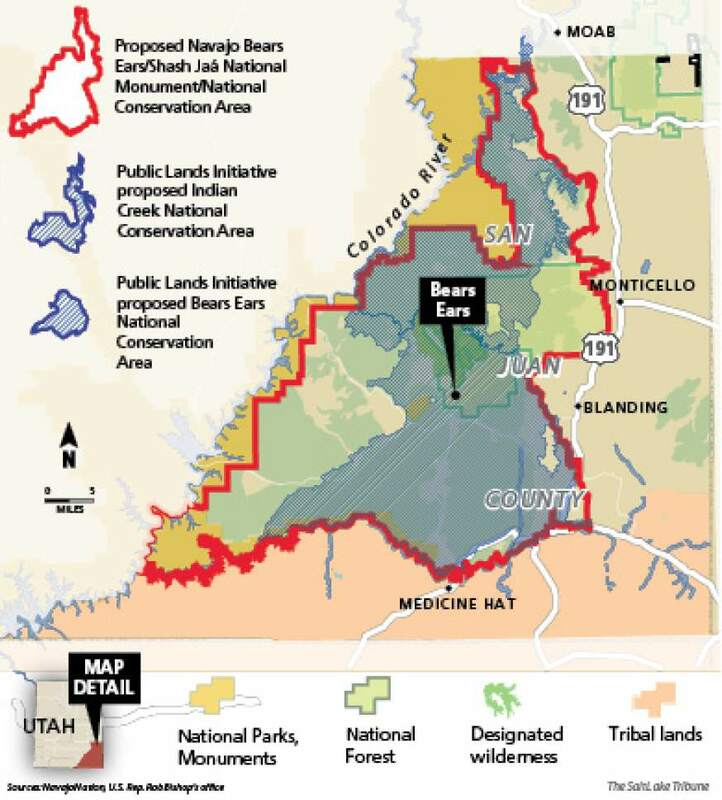 Bears Ears: Comparing proposals The red boundary represents the Navajo tribe's proposal for a Bears Ears National Monument or National Conservation Area, while the blue-hatched regions represent the Public Lands Initiative's proposals for the Indian Creek and Bears Ears national conservations areas. 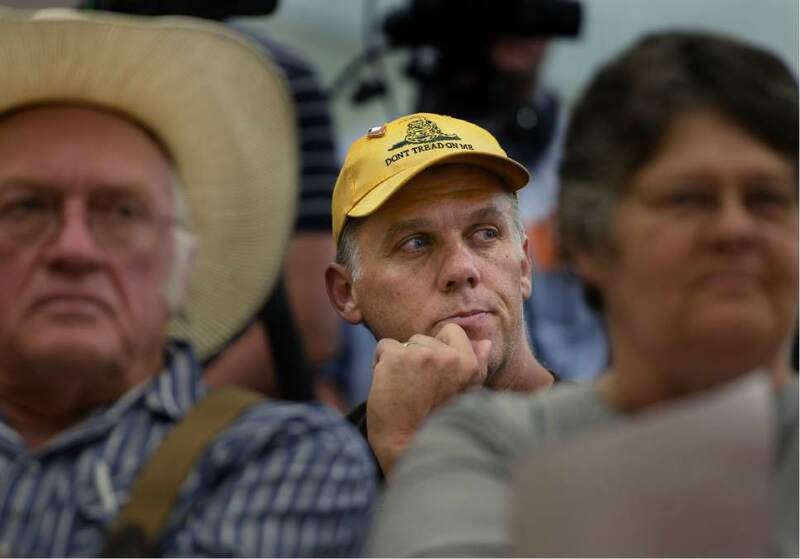 Scott Sommerdorf | Tribune file photo San Juan County Councilman Phil Lyman listens as others speak during the public meeting at the Bluff Community Center, Saturday, July 16, 2016. Scott Sommerdorf | The Salt Lake Tribune San Juan County Councilman Phil Lyman speaks during the public meeting at the Bluff Community Center, Saturday, July 16, 2016. Scott Sommerdorf | The Salt Lake Tribune U.S. Interior Secretary Sally Jewell makes a photo on top of the peak overlooking Comb Ridge. Second from the right is Vaughn Hadenfeldt of Friends of Cedar Mesa, and at right is BLM Director Neil Kornze, Saturday, July 16, 2016. Scott Sommerdorf | Tribune file photo U.S. Interior Secretary Sally Jewell talks with Vaughn Hadenfeldt about ancient petroglyphs - some of which have been vandalized - near Comb Ridge, Saturday, July 16, 2016. Scott Sommerdorf | The Salt Lake Tribune U.S. 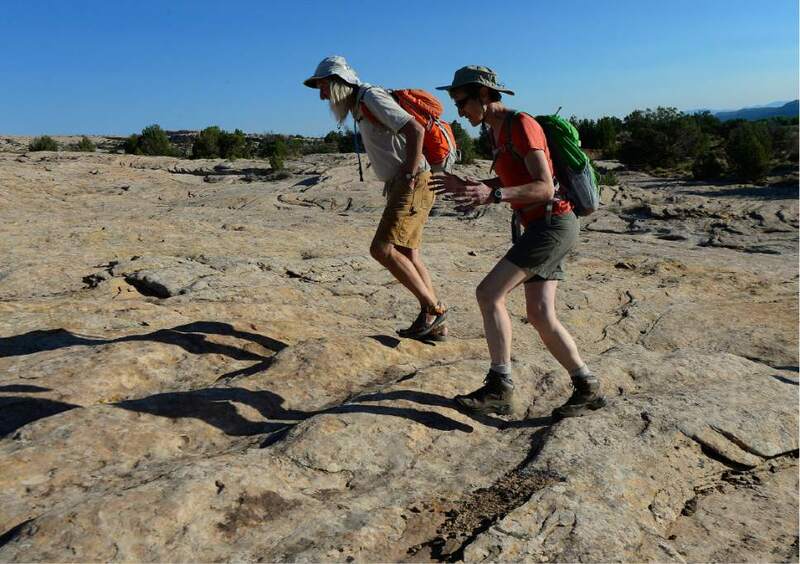 Interior Secretary Sally Jewell walks with Vaughn Hadenfeldt of Friends of Cedar Mesa, over the slickrock on the way to Butler Wash to view petroglyphs - some of which have been vandalized - Saturday, July 16, 2016. 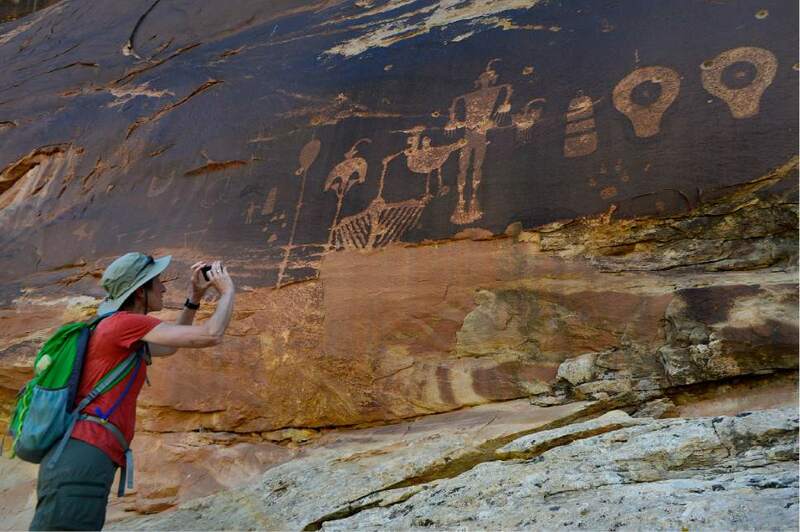 Scott Sommerdorf | The Salt Lake Tribune Ancient petroglyphs in Butler Wash near Bluff, Saturday, July 16, 2016. Scott Sommerdorf | The Salt Lake Tribune U.S. Interior Secretary Sally Jewell hikes with Vaughn Hadenfeldt of Friends of Cedar Mesa, on the way to Butler Wash to view petroglyphs, Saturday, July 16, 2016. Scott Sommerdorf | The Salt Lake Tribune U.S. Interior Secretary Sally Jewell takes a photo of ancient petroglyphs near Comb Ridge, outside Bluff, Saturday, July 16, 2016. 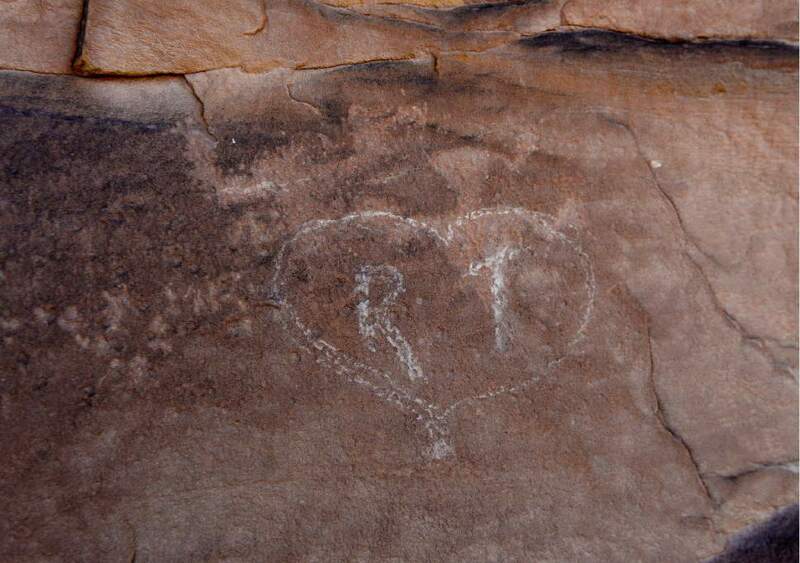 Scott Sommerdorf | The Salt Lake Tribune An ancient petroglyph of a figure was vandalized recently when someone scratched "R T" in a heart over the art dating back to around 600 AD in Butler Wash near the Comb Ridge, Saturday, July 16, 2016. 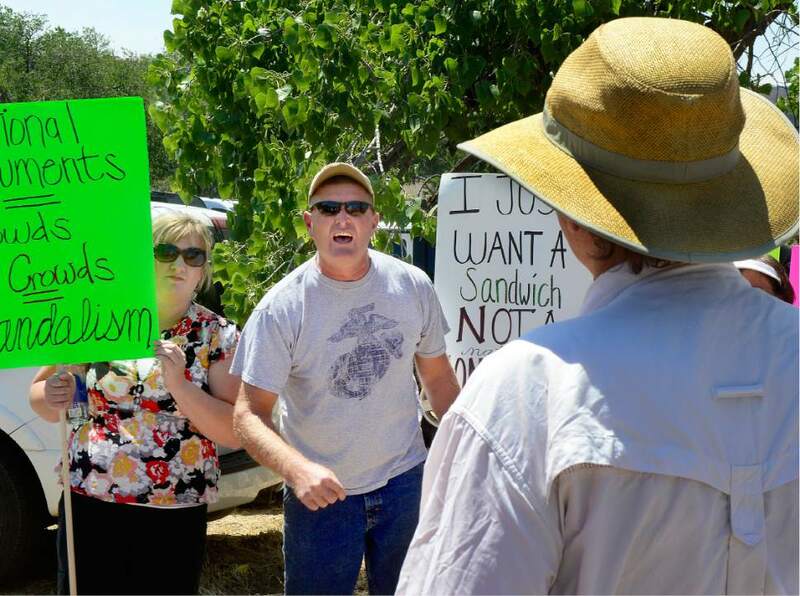 Scott Sommerdorf | The Salt Lake Tribune George Rice of San Juan County, yells at Peter Gatch, right, who came from Park City to support the Bears Ears National Park idea with a sign outside the Bluff Community Center, Saturday, July 16, 2016. Rice mentioned that if Gatch likes the National Park he "should go make one in Park City, and leave the people down here alone." Bluff • Two-and-a-half hours into a scheduled three-hour public meeting on the future of public lands in southeastern Utah, Interior Secretary Sally Jewell asked for a show of hands: Who wanted to extend it 30 minutes? It was stuffy. Cramped. Some in the Bluff Community Center couldn&apos;t see the stage. All told, two dozen local leaders spoke and more than five dozen people were chosen by a lottery system to express their concern for the future of the region, a common thread Jewell has repeatedly noted during her four-day visit. One woman held up crossed fingers as the lottery numbers were read. But with all sides gathered under one roof, the discussion sometimes took on the characteristics of the surrounding geology  dramatic rifts, and bright color. Ute Tribe Chairman Shaun Chapoose turned away from a panel of Interior leaders to tell the crowd that a five-tribe coalition had hoped to secure a seat at the table with a 1.9-million-acre national monument proposal designed to protect the sacred lands. "And here we sit," he said. "Are you at the table? You&apos;re talking." San Juan County Commissioner Rebecca Benally followed to loud applause from monument opponents, saying the proposal has only sown discord between local American Indians, some of whom believe new restrictions will accompany a monument designation. "We have known since 500 years ago and 200 years ago of broken promises and broken treaties," Benally said. She was among those who sometimes drowned out pro-monument speakers with boos. 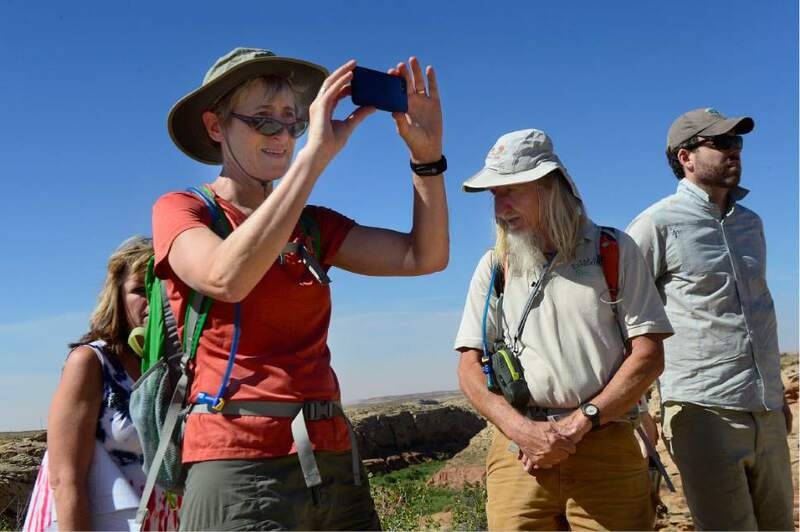 Jewell has said the administration wants protections for the archaeologically rich area before President Barack Obama leaves office, either by using the Antiquities Act to designate a monument or signing legislation brought by Utah&apos;s delegation. Earlier this week, when Reps. Rob Bishop and Jason Chaffetz called for protection of 1.4 million acres here in their long-awaited Public Lands Initiative, Jewell expressed disappointment that it had taken so long. Governor&apos;s Office policy director Cody Stewart said Saturday it might be worth setting both options aside to find another legislative solution. "We have four or five months," he said. "We can do it." The debate inside the community center played out in miniature at the entrance to the parking lot. In response to a sign held by monument supporter Peter Gatch that read "Let&apos;s make it happen," Monticello&apos;s George Rice asked, "Where are you from? Where do you live?" "Why don&apos;t you go make a monument in Park City?" Rice shouted back. Asked by a reporter to explain his opposition, Rice was sorry to have raised his voice. But locals do not support the monument proposal, he said, and seasonal tourism is not the answer for a slumping local economy. The pro-monument Gatch stood shoulder-to-shoulder with Notah Tahy, a Navajo man from Blanding who held a sign reading "No to a national monument" and fears that traditional Native American activities like gathering wood and hunting will be restricted in the meadows surrounding the twin buttes of Bears Ears. Said Gatch: "I just love the beauty and wilderness of Utah." On that point, they agree. Inside, Navajo Nation President Russell Begaye had to raise his voice over cries of "Time!" and "Shut it off!" when he exceeded his two-minute allotment to praise the coalition proposal and urge the Interior officials to accept it. "Your action will be one that will be remembered by our people for centuries," he persevered. 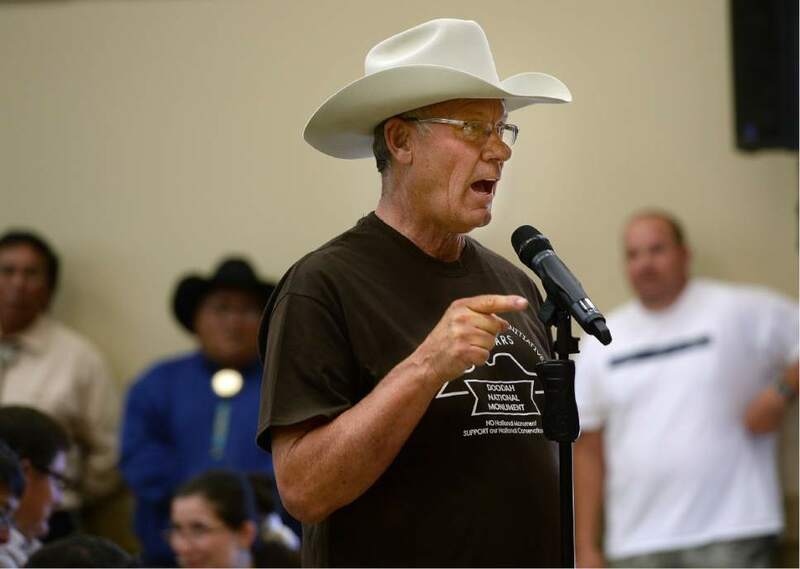 San Juan County Commissioner Bruce Adams drew raucous laughter from some monument proponents when he said "nobody really had settled here" before his own white ancestors. Most speakers, however, were able to complete their thought without interruption. Jewell said afterward that she appreciated the respect that was shown. Some of the debate hearkened back to President Bill Clinton&apos;s use of the Antiquities Act to designate Grand Staircase Escalante Monument in 1996. "All it will do is cause problems," said Garfield County Commissioner Leland Pollock. "Take my word for it." A tearful Jacqueline Orton, the widow of former U.S. Rep. Bill Orton, applauded Obama&apos;s initiative and said this situation is different from that one, which she believes cost her husband his office. Then, she said, Orton found out about the designation when Clinton called him from Air Force One at 2 a.m.
"It was a bad process. We were lied to." Yet many in Bluff believed this monument to be a foregone conclusion, too. It is human nature to exercise "unrighteous dominion," said former Blanding mayor Toni Turk, who warned that if Obama were to act unilaterally, he may cost Hillary Clinton a chance to win Utah. A GOP president would "rescind" a monument designation, he said. Jewell crammed in two more stops Saturday before the meeting, ending a whirlwind four-day tour in which she tried to understand the diverse landscape  to the extent that it&apos;s possible when consistently dogged by reporters, photographers, conservationists and congressional aides. She first hiked at Comb Ridge – the massive sandstone partition separating east from west, high from low, for 50 miles. There are 40 canyons in the ridge, said Friends of Cedar Mesa Executive Director Josh Ewing, and each has at least one archaeologically significant site. Friends of Cedar Mesa President Vaughn Hadenfeldt told Jewell it&apos;s a misconception that the cliff-dwelling Basketmakers and Puebloan tribes lived a brutal life in the arid region. They enjoyed it enough, after all, to do artwork. "This was a good place to live," he said. 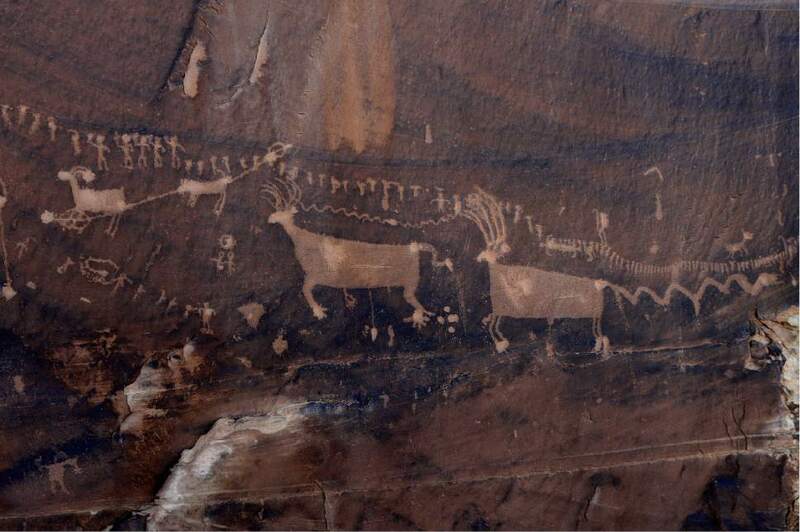 Petroglyphs there include depictions of big-horn sheep, yucca plants, and wavy lines that archaeologists believe might demonstrate the path each artisan has traveled. The lines often emerge from a crack, Ewing said, evoking a deeper spiritual world from which their lives emerged. One particularly dramatic panel featured discoloring along a crack that Hadenfeldt told Jewell he believes to be ashes smeared by a vandal. Later, on the way to view the stark relief of the Wolfman Panel in Butler Wash  on which the artisan uncommonly portrayed the panel&apos;s namesake with musculature, instead of the usual stick limbs  Ewing showed where a C-shaped Pueblo shrine had sat in recent years. 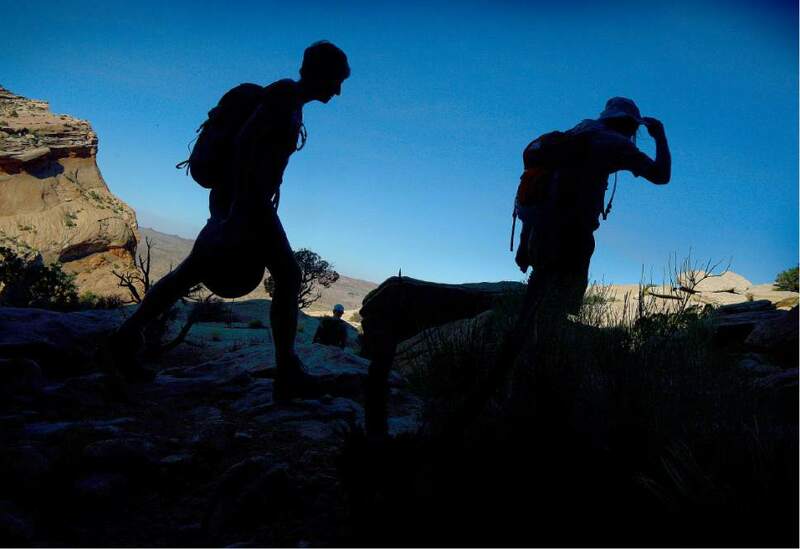 Hikers have taken rocks to make cairns until nothing was left, he said, reiterating the need for better education as visitors continue to increase in the region. Hadenfeldt showed Jewell where indigenous rock art recently gained a new neighbor, a heart encapsulating the initials "R+T." 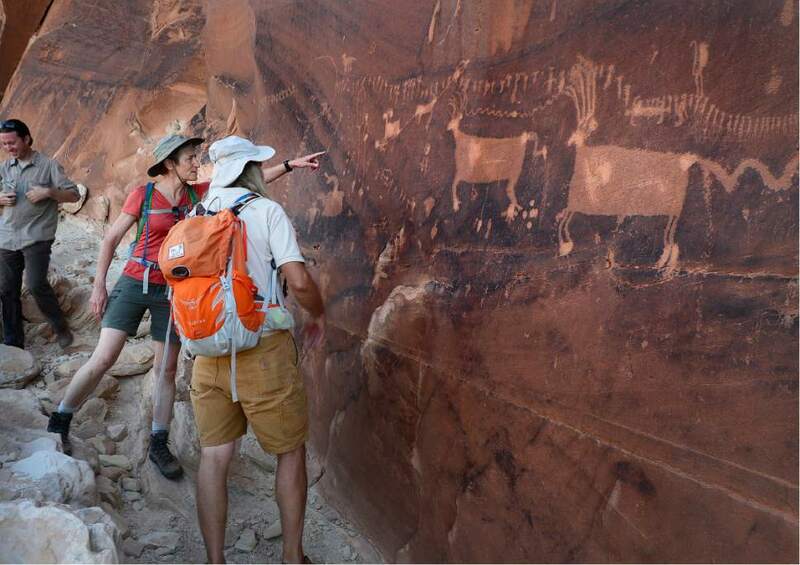 BLM Director Neil Kornze said that no matter what on-paper protections are added, it&apos;s apparent that more resources are needed as the internet guides more and more people to cultural treasures that were once well-guarded secrets. "One way or another, we have to up our game here," he said.